Are "eggsactly" what you're looking for! Easter is a major celebration and festival in many parts of the world. Of course that means its also a great opportunity for coming up with some top Easter Fundraisers. A central character for many Easter celebrations. Someone dressed up in a Bunny Suit makes a perfect host for your Easter Fundraisers, particularly if you are working on fundraising ideas for kids. Don't forget to invite your guests to have their picture taken with The Easter Bunny before they go home. Breakfast, lunch or tea with the Easter Bunny - Invite children to a special Easter Bunny party. Easter Bunny Hop - A fun bunny dance party where everyone has a pair of rabbits ears. Easter Bunny Pizza Party - This is a guaranteed winner with the kids. 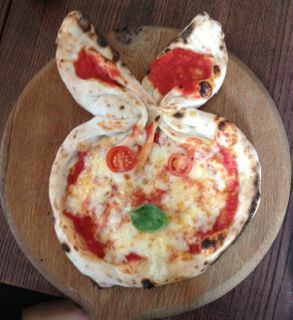 Simply shape your dough into a rabbit's face for a perfect Easter Fundraiser. At all these events having some real live pet bunnies for the children to hold (under supervision) adds another dimension. A few hoppity party games such as musical bumps would also always be popular. You could also combine these with any other Easter fundraising ideas or some of the Easter Egg ideas below. Traditionally Easter eggs are part of the Easter celebrations. 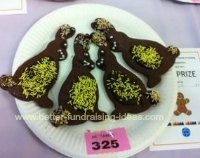 But there are many ways they can be incorporated into your Easter Fundraisers. Easter Egg Hunt - This is a well known part of many people's Easter. Small wrapped chocolate / candy eggs are hidden around a certain area such as a garden, playground, sports field. Children then hunt for the eggs. There are lots of variations fundraisers can do around this. Charge a fee to take part or use the Easter Egg Hunt as a free event around which you can work some other fundraising ideas such as raffles, fete activities and refreshments. How Many Easter Eggs In The Jar? - Fill a jar with small candy eggs. Charge people to guess how many. Closest guess wins. Raffle a Big Easter Egg - A really big Easter Egg in a basket makes a great focal point for an Easter raffle. Easter Egg Cosies - Any knitters in your group? These cute egg cosies are perfect to sell at any Easter Fair. Easter Egg Toss - This is a great idea for sports fundraisers or older school groups. An egg is thrown between 2 people, the distance between them increasing each time a successful catch is made. The winner is the longest completed throw without the egg being broken or dropped. This could be a great focal point for a special Easter event (fancy dress would add to the fun!) or just as a simple fundraiser alongside something else. Golden Egg - There are lots of variations you can do with this fete favourite and it is particularly appropriate at Easter. A tray of painted eggs part buried in sand / shavings. One has a golden mark on its base to mean a prize. This rig up was for Red Nose Day in the UK. 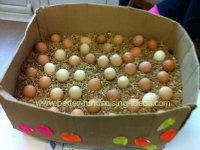 Decorated Easter Egg Competition - Get people to decorate an egg. This might be the most detailed and beautiful ornamentation or the funniest face and accessories (wooly wigs, felt hats etc).If real eggs are too small to show the true artistic talent cover balloons with papier mache and have some bigger efforts. 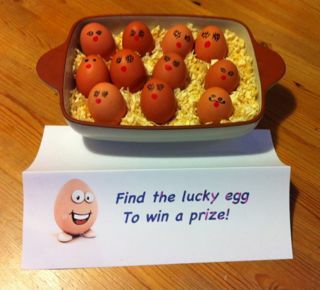 A decorated egg competition makes a good focal point around which you can work some other fundraisers. If your eggs were impressive however you might like to display them, for instance at an Easter Fete, a town centre during Easter or outside your church after the Easter service with a collecting jar, plate or bucket in front of them. People could then vote for their favourites with their spare change; the egg that collects the most cash being the winner. This is a very old Easter tradition but can make a great Easter fundraising idea too. It works very well as a cute fundraising idea for kids as they all get dressed up in hats too big for them and a few of Mum's accessories. 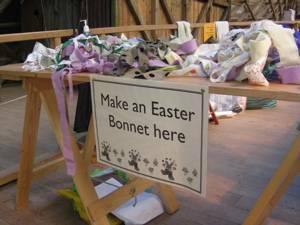 Alternatively encourage children to make their own Easter Bonnet. These can be traditional or a modern take on the idea. All entrants then parade at your fundraising event before a winner is chosen. Tip - The local press love this sort of thing at Easter make sure you let them know.